Does your neighbor smoke? Then you might too. Getting through cracks in plaster, sheetrock and around pipes, electrical sockets and other openings. For many years we have known about the dangers of tobacco use, and now we know that secondhand smoke is dangerous, too. In fact, the U.S. Surgeon General has stated there is no safe level of secondhand smoke exposure, and even low levels of drifting smoke can be dangerous. Studies have found that 60% of children and almost a third of adult renters are exposed to secondhand smoke from cigarettes in their building. Talk to your landlord today about a no-smoking policy for your building. Going smoke-free is the only way to guarantee your protection from secondhand smoke. Many multi-unit property owners believe they don’t have the right to make their housing units smoke-free, but they DO have the right. In fact, the Colorado Clean Indoor Air Act allows owners and managers to make rules for their property and the U.S. Department of Housing and Urban Development encourages property owners to put smoke-free policies in place. Across Colorado and throughout the country, the number of smoke-free housing policies continues to grow as a way to support the health of residents and reduce costs associated with smoking in units. Determine the source of the secondhand smoke. When do you smell smoke: all the time, only in the evening or morning? Where is the smoke entering your unit? Where do you think it is coming from? 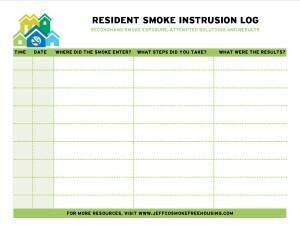 Keep a log of when and where you smell smoke. Make a list of the solutions you’ve tried already. What steps have you taken? Fans, air fresheners, and other “smoke eaters” will only mask the problem, but trying some temporary solutions might help you illustrate the situation to your landlord. Are your nonsmoking neighbors experiencing the same problem? Will they talk to the landlord with you? If you feel comfortable doing so, consider talking or writing a letter to your smoking neighbor and voicing your concerns. Focus on solutions, such as asking them to smoke outside and away from the building. Keep track of all symptoms and illnesses. Document any health problems you and your family are experiencing as a result of secondhand smoke in your apartment. Health problems may include ear infections, sore throats, asthma attacks, and bronchitis. Ask your health care provider to write a letter stating that the secondhand smoke causes your family to be sick. Write a letter to your building manager or landlord. Explain your problem and offer solutions. If appropriate, include a copy of a letter from your doctor explaining your health problems. Keep copies and log any correspondence. Follow up by approaching your landlord to discuss the situation. Be positive, polite, and stick to the issue. Ask to work together to solve the problem instead of getting angry or yelling. Work with your landlord and offer to help think of or implement some solutions. Solutions could include conducting a resident survey, holding a residents’ meeting, relocating to a different part of the building, or ending your lease early to find a smoke-free building. Give your landlord information on the dangers of being exposed to secondhand smoke. Explain the benefits of having a smoke-free building. Emphasize that building owners can legally make their buildings smoke free. For HUD (Housing and Urban Development) units, point out that changing “House Rules” may be easier to accomplish than making a formal lease change. Suggest that smoke-free units can be established. For current renters, a smoke-free policy can be signed during each renter’s lease renewal. New renters can start off smoke free. Your local Public Health Department. For Jefferson County Residents, we can provide you with information, help you write letters, or suggest further steps to take, email tobaccofree@jeffco.us or call 303-275-7555. Your building’s owners, management board, or other policy makers. HUD’s Multifamily Housing Complaint line at 1-800-685-8470 or www.hud.gov/offices/hsg/mfh/hc/complaint.cfm. Your local elected officials such as a city council member, a county commissioner, or a state legislator. Refer to the “Your Rights” tab on this page. When your neighbor(s) smoke, the chemicals and toxins in the smoke can travel through air ducts, open windows, and even electrical outlets to infiltrate your home. Even if you can’t smell the smoke, secondhand and thirdhand exposure may be damaging your health. Click here for more information on secondhand and thirdhand smoke. If you or your family members have severe breathing problems, exposure to secondhand smoke that exacerbates your condition may qualify you to request reasonable accommodation. Severe breathing problems may be considered a disability. Facilities are required to provide reasonable accommodations to persons with severe breathing disabilities, which may include making the facility totally smoke-free. The Americans With Disabilities Act (ADA) and the Fair Housing Act (FHA) state that no one can be discriminated against in workplaces, public places or in housing due to disability. You have the right to clean air. secondhand smoke exposure that substantially affects the your enjoyment of the premises. You are within your rights to ask your landlord to take actions to prevent secondhand smoke from causing harm to you and affecting your enjoyment of the property. Landlords that do not take action may be liable to legal action should you show that you have been harmed. Listed below are some ways you can bring legal action regarding secondhand smoke exposure against the owner, manager or other residents under common law. GASP of Colorado provides a thorough overview of the Federal Fair Housing Act here in Colorado, as well as a list of groups that may be able to provide assistance to residents who qualify to use the Fair Housing Act. 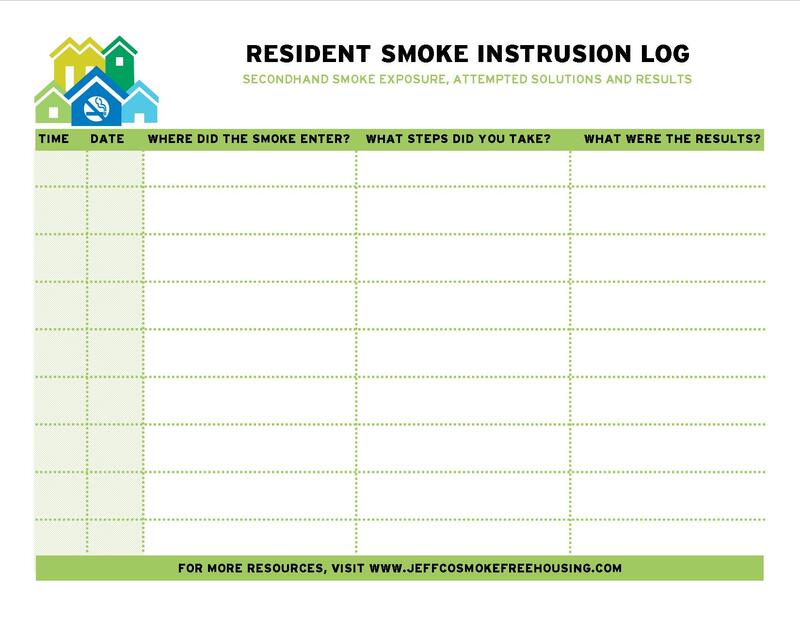 In 2016, Jefferson County public health was invited by the Jefferson county Housing Authority (JCHA) to help residents prepare for the smoke/vapor-free housing policy which went into effect on November 1, 2016. Jefferson County Public Health gathered information and input from residents to identify their needs which will help guide how to best support them in complying with the policy, improving overall well-being and engaging in healthier community connections. Information was collected from residents living in seven JCHA multiunit housing properties between July and December of 2016. More information can be found in the Resident Input Survey Highlights Report. A listing of residential buildings in Colorado that have no-smoking policies for their entire building or property. Provides information about the Colorado Clean Indoor Air Act, free signs, and other materials. The Group to Alleviate Smoking Pollution (GASP of Colorado) is a nonprofit organization working to eliminate secondhand smoke from the air you breathe by advocating for smoke-free policies at work, in public places, and in multiunit housing. Provides an immediate response to basic human needs and promotes pathways to self-sufficiency for Jefferson County residents and the homeless. Support for tenants and landlords. The Colorado QuitLine is a FREE online service available to Colorado residents 15 years of age and over. When you become a member, you get special tools, a support team of coaches, research-based information, and a community of others trying to become tobacco-free. Our expert coaches can talk to you about overcoming common barriers, such as dealing with stress, fighting cravings, coping with irritability, and controlling weight gain. This website is intended to serve as a resource on tobacco cessation and prevention for residents, and public health organizations throughout Colorado. The information included on this website is provided free of charge for the visitor’s convenience with the understanding that Jefferson County Public Health is not engaged in, nor qualified to render legal advice. This website is intended to provide basic information about smoking and the rights of housing providers and tenants with regard to secondhand smoke exposure. Jefferson County Public Health does not warrant that the information included or referenced herein is complete, accurate and/or updated. Jefferson County Public Health disclaims any liability to any person or entity for any loss or damage caused by errors, inaccuracies or omissions, or usage of this information. All risk of loss or damage is solely that of the user of this website. The information provided does not constitute legal advice and should not be interpreted as such. It is not a substitute for advice by licensed, legal professionals. Consult an attorney with any questions or concerns you may have.